Doctors, researchers, social workers, and other professionals at the UNC Center for Excellence in Community Mental Health work diligently to help people with severe mental illness. By providing comprehensive care that extends beyond traditional medical protocol, the center aims to help these individuals regain their independence and livelihood. Approximately 2 million North Carolinians live with some kind of mental illness. The UNC Center for Excellence in Community Mental Health was founded to help the most vulnerable individuals in this population as they try to cope with the symptoms and stigma associated with mental illness. On a Tuesday morning, you get in your car and drive half an hour to see your first patient. He is a 45-year-old man with schizophrenia who has been evicted twice, and may face eviction again if he doesn’t clean his apartment. You help him do laundry, and ask about his medication. When you find out he lost his prescription, you call the pharmacy. Next you drive into the adjacent county to visit a 32-year-old woman battling paranoia and depression. You accompany her to an appointment at Social Security, trying to help her cope with the stressors and distractions that come with an hour of sitting in a large waiting room. The last time you did this, she had a panic attack. Today is better. At 2p.m., you meet with a 24-year-old woman suffering from bipolar disorder and the whims of an abusive alcoholic boyfriend. As you discuss their domestic disputes and the possibility of filing for a restraining order, the boyfriend kicks the door down. You call the police, and then you call your team member — you’re not going to make it to your next appointment. If you work on an Assertive Community Treatment (ACT) team, this is a typical work day. ACT is a community-based service designed to help people with severe mental illnesses such as paranoia, schizophrenia, and bipolar disorder. An ACT team includes a group of professionals from a wide range of disciplines — psychiatry, social work, substance abuse, nursing, vocational rehabilitation, peer support—who visit clients in their homes, providing services that are typically only found in a treatment center or from multiple visits to different specialists. In the United States, approximately 20 percent of the adult population has been diagnosed with some form mental illness. And roughly 10 million people live with severe mental illness, which is defined as a serious functional impairment that substantially limits one or more major life activities, according to the National Institute of Mental Health. Moser and her colleagues at the UNC Center for Excellence in Community Mental Health (CECMH) believe people diagnosed with severe mental illness have a right to live independently with the right support mechanisms in place. 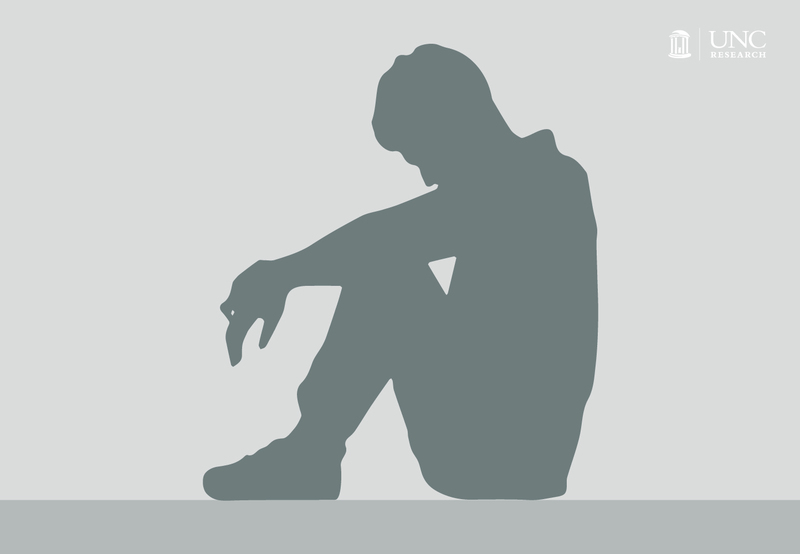 When an individual becomes psychotic, he or she can lose everything — from employment to freedom to housing to relationships. Founded in 2009, CECMH has continued to evolve and expand their services, moving far beyond assessment, medications, and therapy to address the full range of needs to help people in their recovery journeys. The Center provides a comprehensive set of clinical and rehabilitation best practices, for which it provides training and technical assistance, statewide and nationally. Programs like ACT allow the center to provide more comprehensive assistance to patients by combining medical and psychological care with social and rehabilitation services. “The spirit of ACT is you go to their house and do whatever it takes to help them to succeed in the community,” Moser says. These individuals often fall through the cracks because they don’t access outpatient care after they are discharged from a hospital or treatment center. But when they connect with an ACT team, somebody will ensure their basic needs are met including finding housing, receiving primary care, and managing their medication. “You get an opportunity to see people make improvements in their lives — sometimes very slowly — but this is a really effective way to help them make progress,” Clark says. The model for ACT originated in the 1970s, and research over the decades has shown its effectiveness. Despite the strong evidence for it, the access to high-quality ACT services is a challenge in most communities, according to Moser. 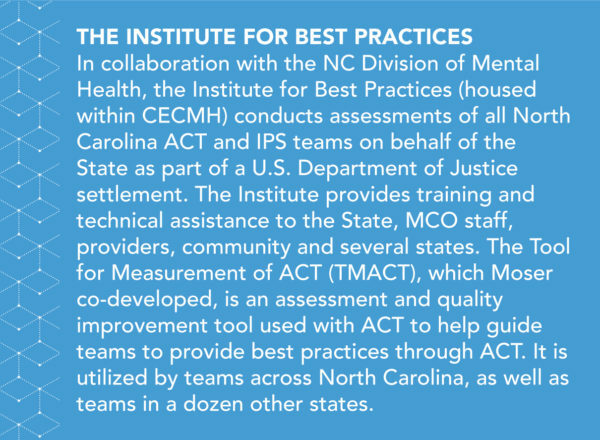 In addition to working with the public through the local ACT teams (serving Orange, Chatham, Durham and Wake counties) the center also provides training, coaching, and evaluation services for the rest of the state. “A big part of our job is to help translate what we know to be good practices into the provider community,” Moser says. In addition to providing medical, psychiatric, and social care to these individuals through ACT, CECMH also helps them find employment through the Individual Placement and Support program (IPS). Within the IPS program, Matt Diehl leads a team of trainers who help evaluate the success of 37 sites across the state. North Carolina isn’t the only state doing this — 23 others host similar programs, as do a handful of international sites. Research from many of these locations shows that the closer a program follows the IPS model, the higher the employment outcomes. In 2012, the U.S. Department of Justice brought a lawsuit against the state of North Carolina for violating the rights of people with disabilities, according to the Americans with Disabilities Act (ADA). The DOJ said North Carolina restricted the rights of people with mental illness by failing to provide adequate opportunities for them to live in more integrated settings, instead of institutionalized facilities. The state entered into a settlement agreement that included requirements to fund programs like ACT and IPS. “A lot of our momentum and support has come from the settlement,” Moser says. Even with the settlement in place, the funding mechanisms for ACT, IPS, and related technical assistance services are tenuous at best. And what will happen when the settlement expires in 2020? What will happen to these programs when lawmakers are no longer obligated to provide funding for them? The problem extends beyond North Carolina to the familiar narrative around the ongoing debate over funding for Medicaid. “Not having Medicaid expansion has not helped things in NC in this regard,” Moser says. People who don’t have access to Medicaid often rely on state funds. From the ACT teams, to their clients, to healthcare organizations, the center acts as an intersection for many different stakeholders. “I think the flux of change will always be a challenge,” Moser says. When the Center for Best Practices started in 2013, there were 12 managed care organizations in the state — now there are seven. “They keep merging and they all have different rules, different funding, different authorization periods — it creates a lot of confusion and uncertainty,” she says. Even when compared to heart disease or cancer, severe mental illness is still one of the costliest health conditions. “Considering the total cost of lifetime disability, and then all the other things — homelessness, jail, unemployment—the societal costs are just huge,” Gilmore says. The direct cost of treating and supporting mental illness is approximately $55 billion a year, according to the American Psychiatric Association. In 2012, mental illness cost the United States $467 billion in lost earnings and public disability insurance payments. John Gilmore is a distinguished professor in the UNC School of Medicine and director of the UNC Department of Psychiatry’s Center for Excellence in Community Mental Health. He is also the Director of the Early Brain Development Program in the Department of Psychiatry. Lorna Moser is the director of the Institute for Best Practices in the Center for Excellence in Community Mental Health, and coordinator of the NC ACT Coalition, a grassroots organization of ACT providers. Emily Clark is the Team Lead for the Wake ACT team, operated through the UNC Center for Excellence in Community Mental Health. Hillary Little is the Team Lead for IPS Supported Employment Staff. 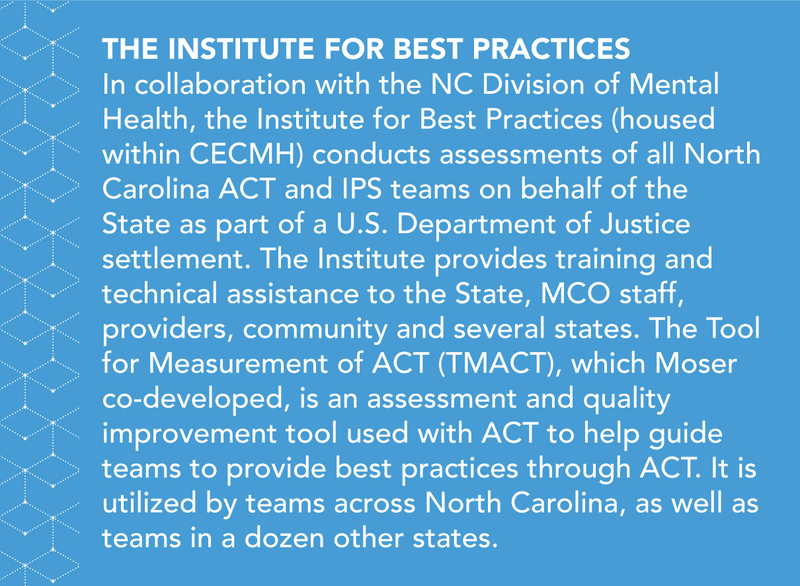 Matt Diehl is the IPS TA Manager at the Institute for Best Practices Center in the UNC Center for Excellence in Community Mental Health.